Tandoor bread (Arabic: خبز تنور‎‎ khubz tannoor, Armenian: թոնիր հաց tonir hats, Azerbaijani: Təndir çörəyi, Georgian: თონის პური tonis puri, Kazakh: тандыр нан tandyr nan, Kyrgyz: тандыр нан tandyr nan, Persian: نان تنوری‎‎ nan-e-tanuri, Tajik: нони танурй noni tanuri, Turkish: Tandır ekmeği, Uyghur: تونۇر نان, tonur nan, тонур нан, Uzbek: tandir non‎) is a type of leavened bread baked in a clay oven called a tandoor, similar to naan. 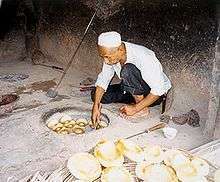 In Pakistan, tandoor breads are popular especially in the Khyber Pakhtunkhwa and Punjab regions, where naan breads are baked in tandoor clay ovens fired by wood or charcoal. These tandoor-prepared naans are known as tandoori naan. ↑ Cavendish, Marshall (2007). Peoples of Western Asia. Marshall Cavendish Corporation. p. 336. ISBN 978-0761476771.